After a quick stopover in Delhi, we headed east to Agra. 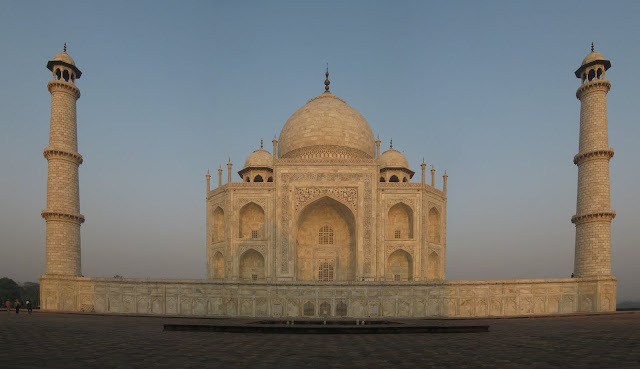 The town of Agra is not much to write home about however, it happens to be the home of India’s (and one of the world’s) most visited monuments – the Taj Mahal. As you may or may not know, the Taj was built by Mugal emperor Shah Jahan in honor of his beloved 3rd wife who died in childbirth bearing their 14th child. In essence, it is a monument of love. In actuality, it is a burial tomb. Shortly after completion of this work of art, the emperor was overthrown by one of his sons and locked away in the nearby Red Fort where he could only catch glimpses of his impressive Mahal from a prison cell for the rest of his life. Upon his death, the evil son was at least courteous enough to bury him within the Taj Mahal too so that the two lovebirds could be united once again. Enough of that history lesson, I’ll let the pics speak for themselves but let me say that this Wonder of the World lives up to its hype. It is incredibly impressive, bigger in person than we were imagining and a work of art from any perspective. What we didn’t know until our visit is that the Taj is perfectly symmetrical. It looks the exact same on all four sides. The minarets and the buildings to its right and left are the same as well. 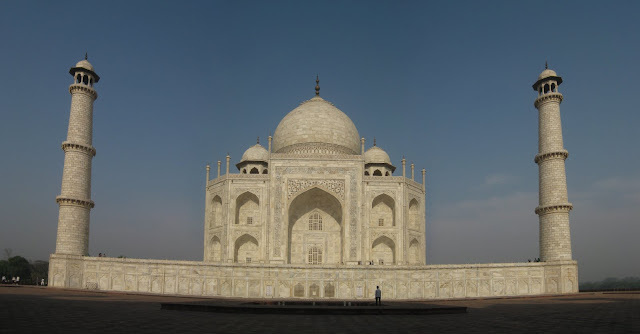 Also note that the Taj is built up on a platform, which allows for an impressive photograph. The Emperor was really thinking ahead on that one as nothing in the background disrupts the monument’s perfect silhouette against the sky. And last but not least, the time of day makes a big difference in what color the Taj will appear to be. We arrived at sunrise when it was glowing orangey-pink. By the time we left a couple hours later, it was glowing bright white. We have many of the same pictures from only a couple of hours apart and the contrast is striking. Okay, okay, I’m done now. Enjoy!